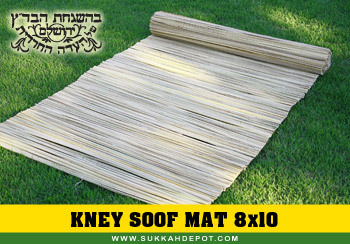 Mehadrin Kney-soof mats are hand woven and posses an attractive, natural appearance. All strings used in the construction of the Mat to join the reeds together are created from natural plants. This mat is available in a wide variety of sizes. Our Kney Soof Schach in accordance with the strictest Halachic standards. The Schach is hand made for the sole purpose of the Mitzvah of Schach. Note: All Schach is certified by the Badatz Eida Haredit, as well as many other leading Hechsherim. The Kney-soof mats are packaged in a sturdy plastic case meant for transportation and storage.